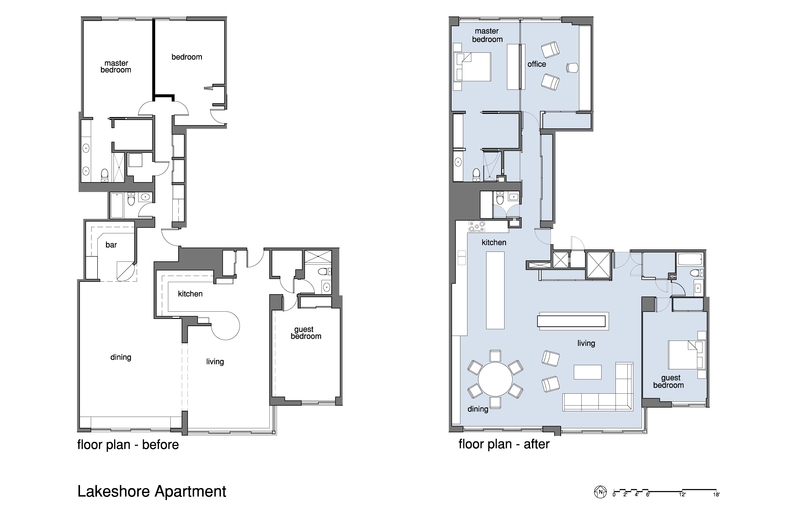 Combining two one-bedroom apartments into a cohesive living space was complicated by low ceilings, dropped beams, large columns and protruding chases. These distractions were relegated to the background by creating a series of discrete built-in cabinets that anchor the living areas. 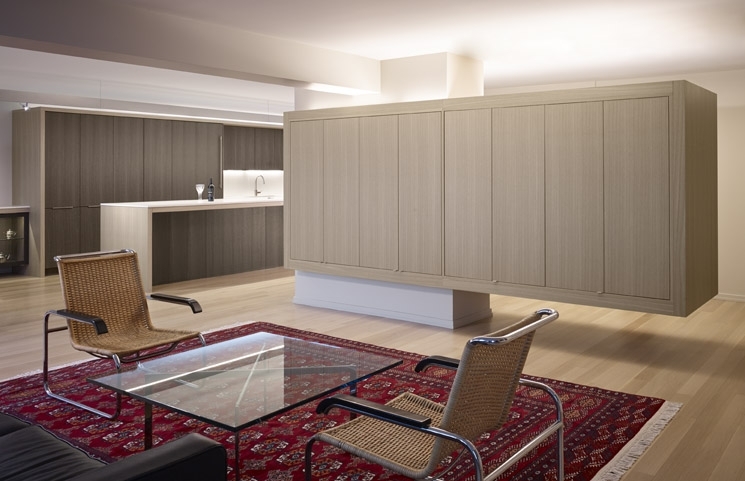 The cabinetry is finished in straight-grained Lati veneer and features a wrap detail that frames each installation. In the kitchen, the wrap joins the various sizes, heights and planes of the cabinet doors into a unified whole. Similarly, the wrap unites the built-in cabinetry in the home office, and organizes the master bath cabinetry into two alcoves. 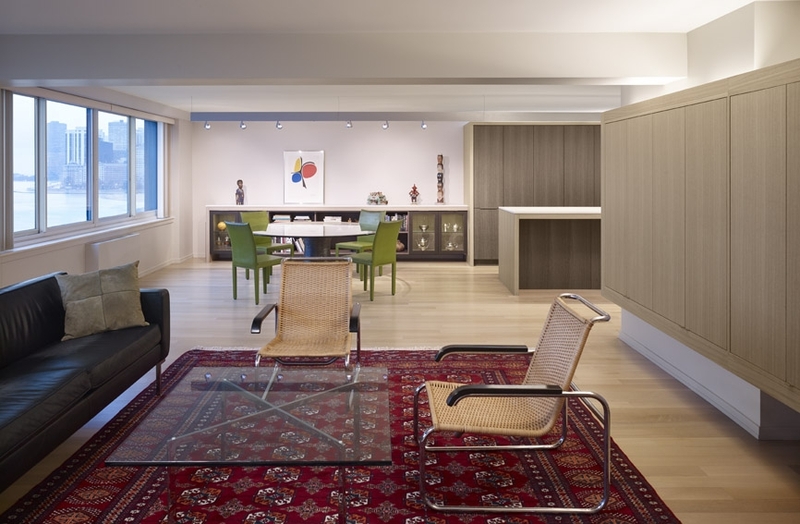 The living room features a two-sided cabinet which cantilevers six feet from a structural column; one side conceals a media center, the other displays art behind glass doors Radiant heating embedded in the ceiling slab made moving electrical boxes infeasible, so lighting the new apartment presented another challenge. Linear fluorescent fixtures with asymmetric reflectors were concealed above all cabinetry to provide indirect lighting. 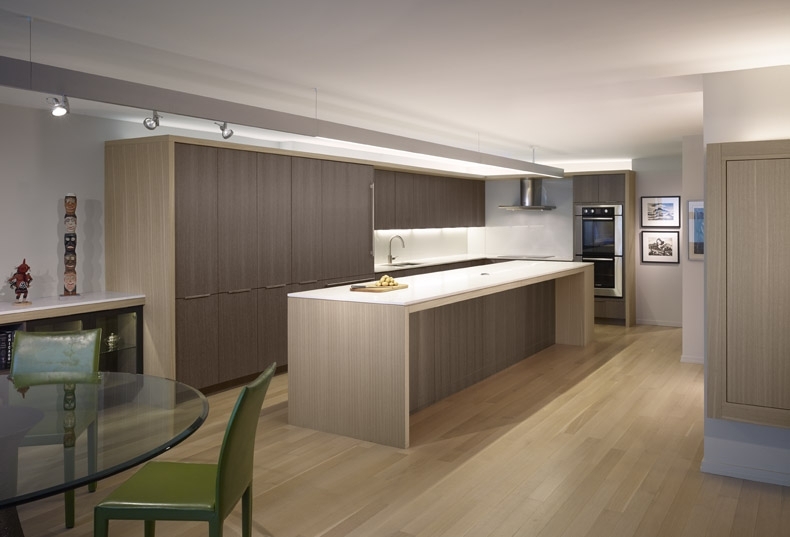 The kitchen and dining room are illuminated by a 28’ long custom extruded aluminum fixture that provides direct down lighting over the island, spotlights in the dining room and provisions for a future pendant over the dining table.